Bungie says it is "saddened" by the impending end of Xbox Live support for Halo 2 and has invited players to get together on the night before the takedown for one last online goodbye. Microsoft announced last week that Xbox Live support for original Xbox consoles and games would be halted on April 15 in order to allow for improvements to the service that will "harness the power of the Xbox 360 and the Xbox Live community." 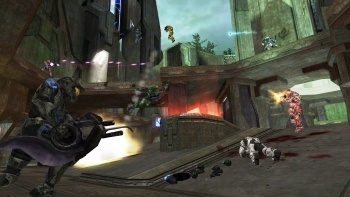 Unsurprisingly, the decision left a lot of gamers unhappy, chief among them fans of Halo 2, which remains popular despite being more than five years old. "We're all saddened at the realization that an era is coming to an end but looking back, we're incredibly fortunate to have had such a great run and such strong support from our fans," Bungie wrote in a message on its website. "Halo 2 has been at or near the top of the Xbox Live charts for original games since it launched over five years ago. We're extremely thankful to everyone who has played, enjoyed and supported Halo 2 over Xbox Live. We've had some great fun together, including far too many humpday losses to even recount." "That said, mark your calendars now - on April 14th let's all rally to go online for one last hoorah," the message continued. "One final farewell and one final opportunity for all of you to kick our asses at Halo 2." There's only one potential problem: The game's matchmaking requirements mean that players must have all Halo 2 downloadable content in order to play online, but Microsoft has already pulled all the DLC for original Xbox games. In other words, old Halo 2 fans looking for one last dance before the lights go down may be out of luck if they don't happen to have all the DLC on hand as well. "On it. Not sure what, if any, solution we can work out, but we definitely can't adjust the playlists over the weekend," a Bungie rep wrote in the Halo 2 forum. "Sit tight." And keep your fingers crossed.